We've been repairing damaged garage doors and installing new ones for a very long time, so if you find yourself in need of professional assistance, you know who to call. Take a look at these projects to see how we helped other homeowners with their issues. Customer Issue: Sensors out of place. 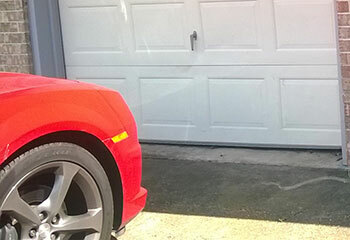 Our Solution: This customer’s sensors had been bumped and were no longer correctly aligned, so we used measuring tape across the door to line them back up at the proper angle to meet again. We then tested to ensure they were working precisely. Our Solution: The damage was quite extensive but luckily didn’t spread to any other panels. We’ve laid down customer’s options for a replacement and provided a safety inspection to ensure the door was operating properly after the service. 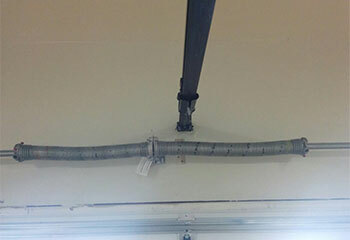 Customer Issue: Damaged cable and a dented track. 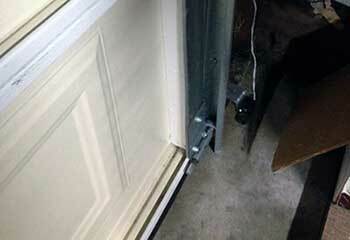 Our Solution: After seeing the tracks were slightly dented, making the door rattle, we realigned them. In addition we’ve also checked the cable and determined it would be best to replace it with one of the multi-strand products we have as spare parts. 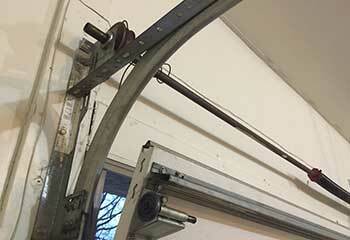 Our Solution: We’ve carefully evaluated the system and recommended a replacement of both springs. After disconnecting the opener, we safely removed the springs and replaced them with a new, high quality pair.